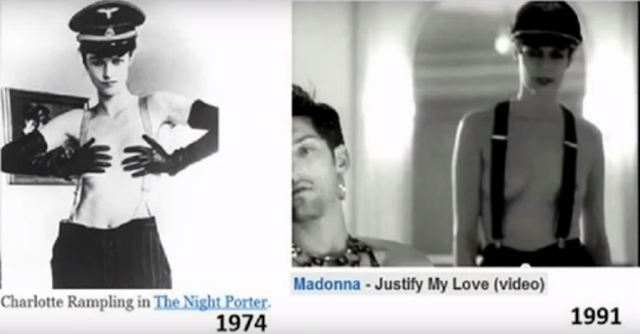 Why doesn't anyone talk about Charlotte Rampling or Liza Minelli but Madonna when comparing other female singers like Elin Lanto? I thought it's because her 'tributes, hommages, reinventions, imiatations, recreations, sampling.." etc. are about taking someone's ideas, passing them to mainstream as own without crediting nor mentiong creators. However when it comes to Marilyn Monroe everyone knows that Madge copied/imitated her. When someone else like Miley Cyrus or Gwen Stefani does it, they are still compared with Mummydonna, not with original. So what is the reason? Why are all female singers and celebrities compared to her? Is this her PR's, pseudojournalists who get paid for it doing?